Technical writing needs to be orderly, but to insure that it’s read and understood by busy people, it definitely shouldn’t be dense. Aside from writing reasonably short, orderly sentences, adding subheads when the focus changes a bit is a mechanical, but very helpful, way of keeping a reader with you. Subheads are perhaps a tech writer’s most valuable organizational tool. Tom Johnson, on his excellent “I’d Rather Be Writing” technical writing blog, deals with the virtues of subheads at some depth. Tom took a poll on why “users can’t find answers in help material.” And he found that “help is either too long so users can’t find the answer, or help is too short so users can’t find the answer.” So what’s needed is a mechanism to facilitate organizing and scanning a page. (Oh, there’s that “f” word again.) Subheads are the answer both to orderly writing and orderly page layout. A maximum of four indented subheads on a page, as illustrated here, may actually be too many, unless your material is so complex that it requires them. Definitely avoid run-on subheads, as much as run-on writing. The idea is to be organized, not typographically lush. Typographical techniques aren’t a substitute for clear, well-organized writing, just helpmates in negotiating your terrain. The eye can be distracted by too many of them. When you first see the upper “body” of the InMoov robot that will be demonstrated at the World Maker Faire show in New York’s Queens County next month, your impulse is to exclaim, “Frankenstein!” But that would be mistaken, for there is no monster, nor his novelistic creator, a modern-day Mary Shelley, behind this robot. Instead, there is Chuck Fletcher, who is one of an Internet community of people developing inMoov robots, part-by-plastic part, with 3D printers. What’s that? you say. You’re right – InMoov is a lot to swallow in one gulp. But from what we can gather from the Maker Faire website, a deftly functioning robot (or ranks of them around the Internet) is emerging from the plastic sands, or resins, of 3D printers, which are amazing enough in themselves. This is where you need to start: The Make site advises that Chuck Fletcher will be bringing to World Maker Faire “a fully articulated and animated 3D printed humanoid animatronic robot.” Got that? 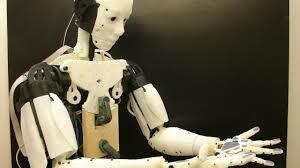 “The build,” Chuck continues, “is based on the open source inMoov project by Gael Langevin. This is an amazing project with hundreds of parts and a growing community of makers adding features like eye tracking, hand and finger control using the Kinect and LeapMotion devices.” Suddenly, there are too many “makers” to count and too much ingenious technology to readily grasp. First, in the opening sentence, there’s a semantic miscue – “I kicked up a bit of a dust last year…” (italics added) “I kicked up a bit of dust…” is correct, of course. Then, in the next sentence, an apostrophe is omitted in “an applicants attention to detail.” (Even WordPress has this underscored.) And there are several other instances in which apostrophes are omitted. In the sixth paragraph, we have quote marks missing around the sentences beginning “I’m sorry…” And this paragraph ends simply, “My bad.” “My bad” what?